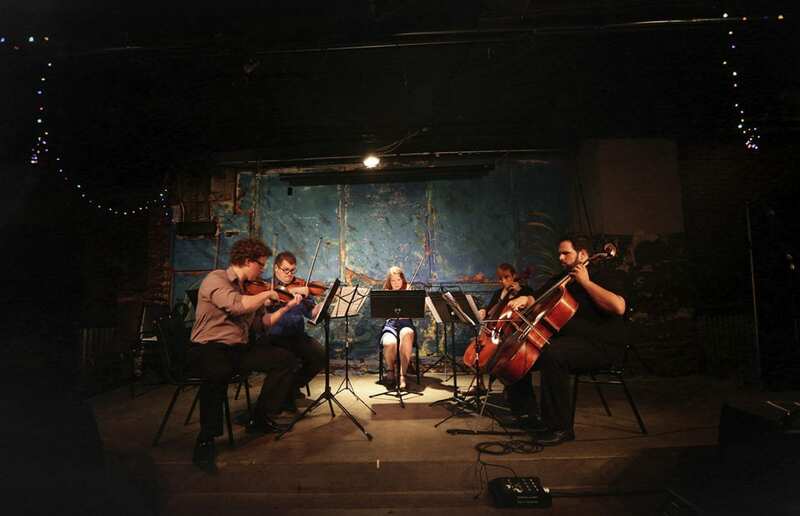 A local string quartet aims to bring classical music to a younger audience. Classical Revolution KC is part of a growing trend to bring classical music out of the concert hall and back into people’s lives via serendipitous discovery. “If you just grab a random 30-year-old off the street and ask, ‘Do you go the symphony?’ they’ll say, ‘No.’ It’s just not their scene,” said Nick Bell, co-founder of Classical Revolution KC, chatting after their “Chamber Music in the Bistro” performance in the bar of Californos in Westport. 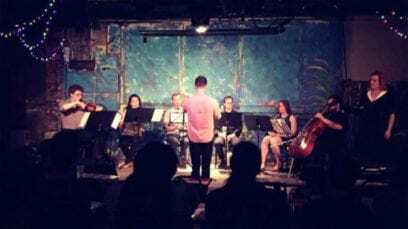 CRKC presents a show every fourth Monday at Californos. On a warm evening in March, the French doors of the patio were opened to the street to patrons and passersby as the strains of François Borne’s Fantaisie Brillante on themes from Bizet’s Carmen for flute filtered out, an episode of Shark Tank on mute in the background while bartenders took orders and poured drinks. A few people moved closer to take videos on their phones; a member of the kitchen staff caught a few minutes of music between orders. The brother and sister team grew up in the Parkville, Missouri, area, where their parents were music teachers. They both graduated from the University of Missouri-Kansas City’s Conservatory of Music and Dance. Alyssa is a violist and has performed with the Kansas City Symphony, Topeka Symphony, and Symphony of Northwest Arkansas. She recently completed her master’s degree at the Peabody Conservatory in Baltimore, Maryland. Nick is a trombonist, but has turned his focus to conducting, serving as music director for CRKC. So they decided, with some of their friends, to put on a concert of Arnold Schoenberg’s Verklärte Nacht at Harling’s in Westport, calling themselves the Harling’s Chamber Ensemble, at first. But while Alyssa was visiting potential graduate schools she heard about an organization called Classical Revolution. They decided to adopt the name because it was philosophically similar to what they were already doing, had a certain amount of brand recognition, and they were already starting to play at different venues. KCPT’s Producer Ashley Holcroft and Videographer Dave Burkhardt take a look inside Classical Revolution KC, founded by siblings Nick and Alyssa Bell to break chamber music out of the confines of concert halls and into unexpected places. Additional footage provided by Josh Wise. What is Classical Revolution? The organization started out of the Revolution Café in San Francisco in 2006, but the concept has expanded internationally and now boasts over 40 autonomous chapters scattered throughout North America and Europe, each unique to their cities and communities, playing a variety of repertoire — Beethoven, Bowie, Beatles, Berg — in every venue imaginable — pubs, parks, museums, living rooms, art fairs, and even sidewalk shows. Their aim is to enrich their communities with accessible chamber music and create support for area musicians. CRKC began in 2013 with a core group of devoted musicians and an audience of friends and family. They host casual recitals once a month with larger scale works programmed throughout the year. But as an inchoate arts organization, reliant on donations and ticket sales (when they sell tickets — most of their performances are free) they have little budget to pay musicians, so it was a struggle at first to get people to perform for little or no money. The series has hosted music students from UMKC and KU previewing recital pieces, professionals looking for an outlet to test out new repertoire, and talented amateurs happy to have an opportunity to keep their skills honed. Once they had a steady roster of willing and able musicians they could focus on expanding their audience. “I think the biggest thing that we’d like to do is catch those who don’t really know what’s happening,” said Alyssa. As the performer base grew, that gave them the opportunity to program larger works in different venues, and from there they’ve expanded their scope, hoping to cast an even wider net. This past year saw performances of Antonín Dvořák’s “String Serenade,” Igor Stravinsky’s “Octet for Winds,” and Wolfgang Amadeus Mozart’s “Gran Partita” in Californos’ Ballroom, and Arnold Schoenberg’s “Pierrot Lunaire” in Westport Flea Market’s Buffalo Room. CRKC also collaborated with songwriter Claire Adams, performing her songs arranged for chamber orchestra at the Buffalo Room and recording the EP (extended play) In the Blue last summer. The group welcomed classical guitarist Adam Levin for a solo show and invited young musicians from the Heartland Chamber Music Festival to perform in the chamber music series. Interested performers can contact them through social media or their website classicalrevolutionkc.weebly.com to learn about participating in the series. “It’s nice having the creative freedom to do what we want to do month to month. We have projects that we’re spending a lot of effort putting together and then have months where we’re able to take it easy and just play music in the Bistro,” said Alyssa. The group recently started a monthly series at Vinyl Renaissance & Audio’s Overland Park location for a chamber music recital every second Sunday. Next season, they have plans to collaborate with the Midwest Chamber Ensemble and are in talks to perform some of Stravinsky’s compositions with a jazz big band. Another step in their growth is becoming fiscally sponsored through Fractured Atlas, which garners them 501(c)(3) non-profit status, a useful and necessary step toward securing grants and offering a tax-deductible option for donors. CRKC joins a growing network that inserts classical music into venues all across the world, a grassroots movement based on the joy of performing and sharing classical music in a way that makes it exciting and open to new opportunities, instead of stifled by conventional stereotypes. But the real reason is more pure: “Seeing people enjoy it is what makes me enjoy doing it,” stated Alyssa. So if you walk into a bar and see a string quartet playing, grab a beer, pull up a chair, relax and enjoy. — KC Studio is a magazine that covers Kansas City’s performing, visual, cinematic and literary arts, and the artists, organizations and patrons that make Kansas City a vibrant center for arts and culture. For more information about complimentary subscriptions to KC Studio go online at www.kcstudio.org.